Maintaining your HVAC system is relatively easy, but it is something that gets put on the back burner by many homeowners until they experience a problem. 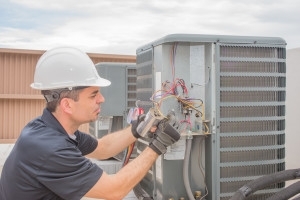 To avoid these costly HVAC repairs, it’s important to keep up to date with maintaining your unit and there are numerous things you can do yourself that will make a difference so you’re not always calling your local handyman. Clean or replace filters as needed. The air filters within your unit help remove particles of dust and debris from circulating into clean air. Yearly maintenance. Making yearly maintenance appointments with an experienced technician will extend the life span of your unit. The will come in, clean your unit and ensure your filters and any other parts are working correctly. Clean up debris. Keeping your HVAC system clear of leaves, sticks, and any other debris is crucial to ensure your unit isn’t overworking, which can lead to a shortened lifespan. Check the inside of the unit and remove any debris and particles as well as the area around the unit. To book your maintenance appointment before the snow starts to fall, call A+ Plumbing, Heating & Cooling today at (603) 518-5777.